Extra(ordinary): A Print for Me? Yesterday a package arrived for me. 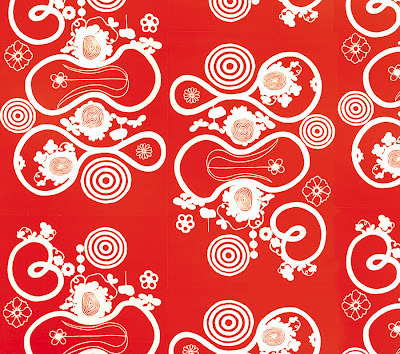 It was a bright fluorescent-red, hand-printed wallpaper print by Nama Rococo. The great thing about Nama Rococo is that you can purchase single sheets, therefore you don't have to wallpaper an entire wall if you don't have the space or money. The prints are fun and colorful with reference to tradition and the Old World. Prices start at $126.